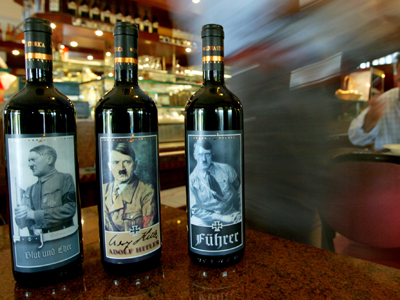 A Jewish couple was “shocked and startled” to find bottles of wine sporting the portrait of Hitler in a town in northern Italy. The country’s authorities were quick to launch an investigation. ­American Jews Matthew and Cindy Hirsch noticed the labels with various portraits of the notorious Nazi leader in a supermarket in a town of Garda, where the couple was on vacation. One of the bottles featured Hitler performing the Nazi salute, while another label had a portrait of the Fuhrer and the words "Mein Kampf" (“My Struggle” in English), the infamous book exposing Hitler’s political views. The outraged tourist said he had asked for an explanation from the shop owner, but got an answer that it was just history, "like Che Guevara." “If a company bottles and labels these products, evidently, in Italy this is allowed. But how brazen do you have to be to make money off the tragedy of millions of people dying?” Mrs Hirsch said. She took it very much to heart, as her father survived one of the worst labor camps of Nazi rule, Auschwitz. Mrs Hirsch’s grandparents, aunt and other relatives died at the concentration camp. "It is not only an affront to the Jews, but to all humanity,” she said. The prosecutor’s office in the Italian city of Verona has already launched an investigation into the matter. The current charge, according to prosecutor Mario Giulio Schinaia, is violating an Italian law known as the ‘apology for fascism’ – one that prohibits promotion or distribution of fascist symbols and ideas. "But perhaps one should also create [a charge] for human stupidity", he added. According to ANSA news agency, the mayor of Garda said he would do everything possible to make sure the bottles are taken off the shelves. Prosecutors have also said they are considering confiscating the goods. “I understand how this gadget can be marketed, but there also has to be the question of good taste and respect,” mayor Antonio Pasotti told local media. The bottles are part of the so-called "Historical Line" of the Lunardelli winery in Italy, and it isn’t the first time they’ve caught the media’s attention. A similar scandal over the Hitler labels produced by the company, occurred in 2007. It resulted in police confiscating 20,000 bottles, however a local court later ruled the bottles must be returned. Other wine labels made by the Lunardelli company caused similar outrage among the general public – for instance, those portraying fascist dictator Benito Mussolini.